UIDAI Aadhaar Certification Exam Registration Process for Operator/ Supervisor/ MIS Coordinators and Data Entry Operators and Technical Persons, UIDAI Certification/Biometric enrolment kits Uitilization Exam, Online UIDAI Exam, Online Aadhaar Operator/Supervisor exam Registrions at NSEIT exam portal, Handling Of Aadhaar & Enrolment Certification Of UIDAI Operator/Supervisors. Registration of Their Candidature For Online UIDAI Exam/Aadhaar Operator/Supervisor exam: The attention of the District Educational Officers/Project Officers in telangana State are informed that of the training has ben given to MIS/Data Entry Operaor/Technical Persons requested to enroll their names in NSEIT exam portal for the purpose of attending exam. As per the DSE Telangana Rc.3238, Dt:17-10-2017:: Training Programme has been given on UIDAI Certification/Biometric enrolment kits Uitilization for Operator/Supervisor. DSE Telangana has conducted the Training for Aadhaar Enrollment Certification of UIDAI Operator/Supervisor and Collected all MIS Coordinators and Data Entry Operators and Technical Persons details and also collected (photo and signature of particulars in <30 kb for Aadhaar Operator/Supervisor exam Purpose) in attached Format. Attention of all the Districts Educational Officers&Ex-Officio District Project Officers. Updation of Child Info With Aadhaar by Tecnical Persons, Mis Coordinators/Data Entry Operators Training Programme has been conducted On 23/10/2017 to 01/11/2017 at Godavari Hall o/o of SIEMAT,Hyderabad. DSE Telangana -Rc.No.3238/TSSA/MIS/T7/2017 - Dated:21/1 l/2017:: Sub:- TSSA, Hyderabad - Planning & MIS - registration/enrollment of their candidature for online examination to MIS/Data entry operators/Technical Persons trained in UIDAI Working at MRC's& DPO's - Aadhar Enrollment - for Certification. - Reg. The attention of the District Educational Officers/Project Officers in the Telangana State are informed that of the training has been given to MIS/Data entry operators/Technical Persons on UIDAI - Aadhar enrollment as State Project Office, Hyderabad and requested them to enroll their names and Upload their information in the examination portal for attending the exam. Out of 770 persons only 200 persons from 8 districts has registered their names in the examination portal (NSEIT). In view of this the DEOs & Ex-officio PO directed to instruct Manadal MIS coordinators and data entry operators & technical persons to register their names in the UIDAI iexamination portal by 30th November 2017. • The Maximum File size of photo graph is 30KB and only jpg,jpeg,gif,bmp,png images are accepted. Please ensure that you upload a recent passport size photo of 2'x2' inches. • The Maximum File size of signature is 30KB and Only jpg,jpeg,gif,bmp,png images are accepted.Please ensure that you upload a recent signature of 2'x2' inches. 3. User will be created and user id will displyed on screed and will be sent to registered mobile number as well. • Read the instructions and click on continue. • Click on validate to confirm your name with Aadhaar. • Upload signature which is scanned earlier and click on continue. • All your details will be shown as preview. • Check all your details. • If all details are correct click on proceed to submit button to complete the registration process. • Download the challan copy from home page and print the challan. • Pay the challan of Rs. 365/- in any SBI branch and get the journal number. • Login to portal using username and password. • Click on payment tab. • Select the state and appropriate city. • Select the test center shown in the list. • Select the available date and time from list. 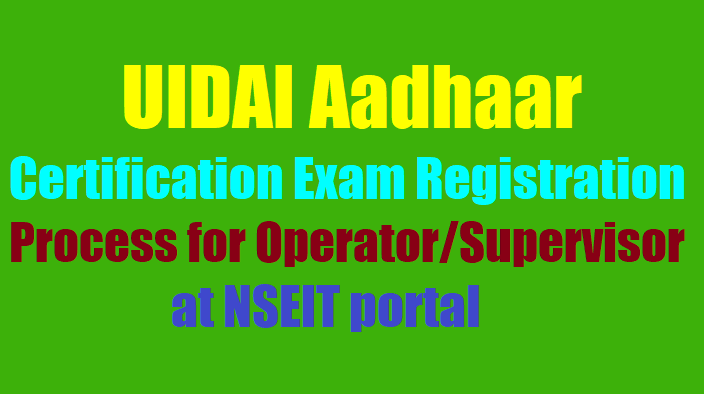 Candidate will be required to select "Level of Exam" as UIDAI Certification for Operator - Supervisor or Operator Child Enrolment Lite Client at the time of registration for the test. Candidates certified in Child Enrolment Lite Client will be able to work only on CELC application software only. They will not be able to do any other type of enrolment. i.e. on ECMP as Operator/Supervisor. However candidates certified as Operator/Supervisor will be able to work both on ECMP and CELC. Candidates have to provide correct Aadhaar No. or EID No. and all the details like Name, Date of Birth and Gender should be as per the Aadhaar Card Details of the candidate. Any mismatch will cause delay in Certificate Activation at later stage. Candidates have to bring the Original Bank Challan and Valid ID Proof along with Admit Card on the examination date. Original Bank challan will be submitted at the time of exam. The exam will be composed of 3 modules i.e. Basic Knowledge of UIDAI and Aadhaar, Demographic Data entry & Biometric Data Capture for Supervisor/Operator Certification and 2 modules i.e. Basic Knowledge of UIDAI and Aadhaar & CELC Manual for the Operator CELC Certification. The duration of Test will be 1 hour 45 minutes with Text based Multiple Choice Questions only. For Operator/Supervisor Certification there will be 75 Questions. For Operator CELC there will be 50 Questions. The candidate securing equal to or more than 50 % marks of the max marks shall be given the certificate of Supervisor. The candidate securing 40 % or more but less than 50% shall pass the test as Operator and will get operator's certificate. The candidate securing more than 40% in CELC Exam shall be declared pass and will get Operator CELC Certificate. The candidate securing less than 40 % shall be declared fail and therefore no certificate in such cases shall be generated. As per the UIDAI's new testing and certification policy "The candidates must schedule their test within 6 months of depositing the fee, failing which, their fee shall be forfeited and they shall not be allowed to appear for the test against that fee." Go to the nearest State bank of India Branch with the Fee payment Challan and pay, in Cash, the appropriate Test Fee in CBS Account No. 33029715480. at SBI Mumbai Main Branch. Obtain the Applicant's Counterfoil Copy of the Application Fee Payment Challan duly receipted by the Bank with (a) Branch Name & Code Number, (b) Journal/Scroll number, (c) Date of Deposit & amount filled by the Branch Official. Candidate must make fee payment atleast two weeks in advance prior to the tentative Exam date. Payment of Test Fee through Demand Draft/ Cheque/ Money Orders/ Postal Orders or any other mechanism will not be accepted. Applications once made will not be allowed to be withdrawn or fees once paid will not be refunded on any account. Valid personal e-mail ID.It should be kept active till the completion of the exam process as they may get any notification from the testing / certification agency anytime. Scanned passport (pp) size photograph in JPEG format of less than 30 kb. Scanned Signature in JPEG format of less than 30 kb. Applicant's Counterfoil Copy of the Application Fee Payment Challan duly receipted by the Bank with (a) Branch Name & Code Number, (b) Journal/Scroll number, (c) Date of Deposit & amount filled by the Branch Official. Candidate has to first register by Clicking "New User". Candidate will enter the required details and click on the Submit Button to register. After candidate clicks on submit button, registration id will be displayed on the screen. Candidate has to carefully fill in all the relevant personal details in the online form. He will have to upload his photograph & the signature as well. Candidate has to carefully fill in the details from the Fee Payment Challan in the Online Application Form at the appropriate places. Registration No. and Password needs to be retained for further reference safely. Candidates need not send the printout/ fee payment receipt to the Testing and Certification Agency. Two days after the payment of fee at SBI Bank through filled Bank Challan, Candidate will receive an email and SMS notifying the payment status of the candidate. On successful payment, candidate will login in to the website using his Registration ID and password and he will be allowed to book his exam slot. Candidate will be able to take the printout of his Admit Card after booking slot for exam. The candidates should retain the print out of Admit card with them and will bring it with on the day of examination. The candidates are required to bring a photo identity card also along with their printout of Admit Card & counterfoil of the fee payment challan on the day of examination. Candidates are advised to keep a photocopy of the fee payment challan for future use. For any query Candidates can contact on below given contact No. Candidates can also send their queries at uidai_admin@nseit.com.